I have been following Heath Nicholson Builders on Instagram for a while now, watching their various projects progress. So I got in touch, asked if I could write an article about one of their projects. 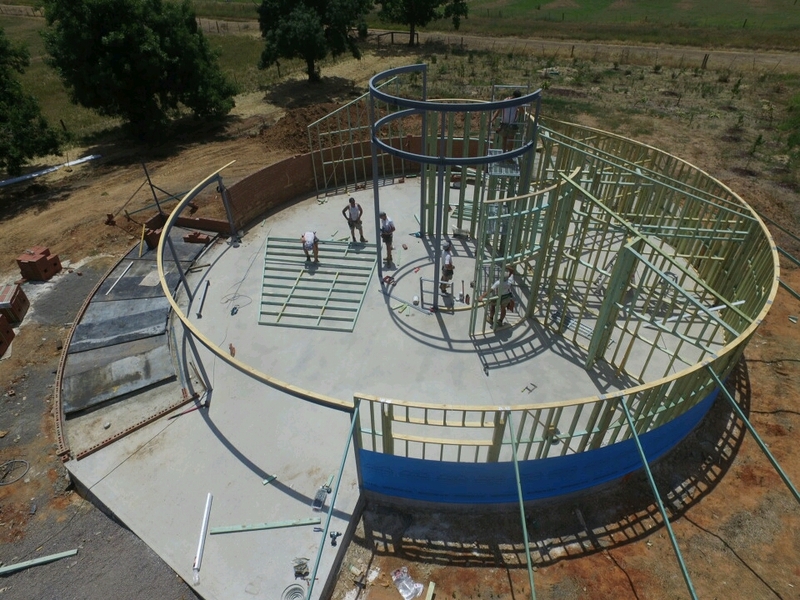 Heath Nicholson Builders aerial photo of frame stage with the guys working. Heath was more than happy to help out with an article and said that the “Round House” they are currently working was a once in a career opportunity. Before we get into the project, talking with Heath, in particular asking to write about a project of theirs has been easy. In my experience, people that are willing to help out another person is a credit to that person. A person’s willingness to help others can tell you a lot about how they run their business, and this is no different with Heath. We have all heard that social media is a powerful marketing tool. It was social media that prompted this client to contact Heath. Heath Nicholson Builders feature roof rafters. 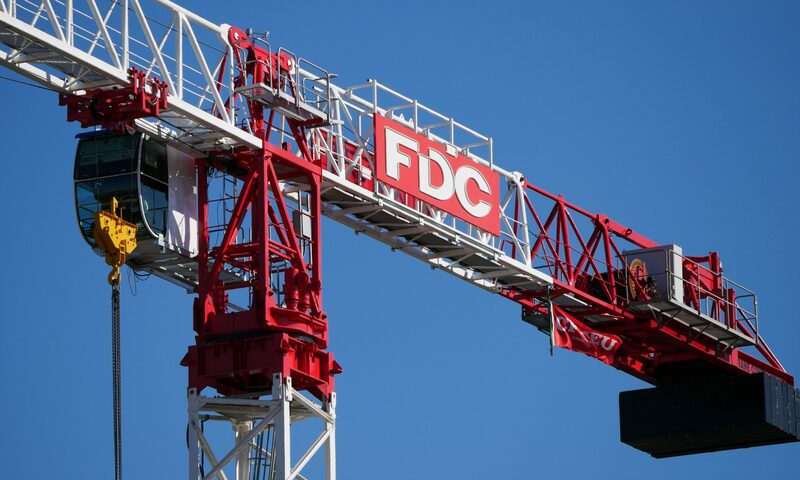 As you look through the photo’s, you can see that it’s not just a straightforward building. As we all can imagine, a circular building is going to be a nightmare. 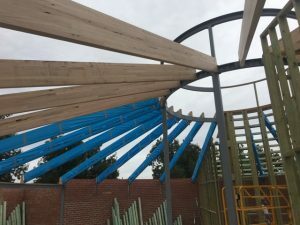 The curved walls have been creating daily challenges, especially being constructed out of timber, steel and brick. We are not talking a nice large gentle radius, the radiuses are tight. 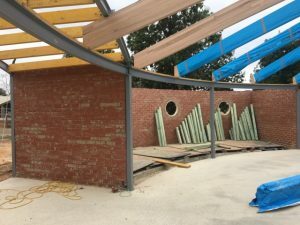 Heath Nicholson Builders curved steel beams. The level of workmanship that is going into the project is second to none. As we all know doing something right doesn’t take much more time. As Heath said, they are on track and have only be slowed by wet weather. 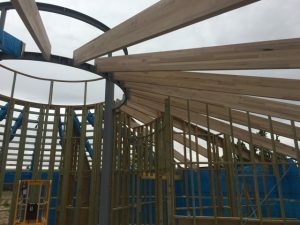 Heath Nicholson Builders roof rafters following the round shape of the home. According to Heath, the openable domed glass roof in the center of the building is going to be a fun challenge. The domed glass is currently being designed and will be interesting to see how they make this happen. 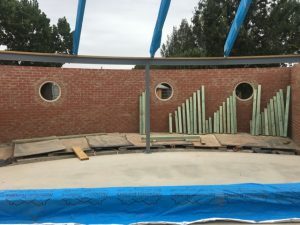 Heath Nicholson Builders curved brick wall with matching round windows. There have been no specialised subcontractors brought in for this project either. The team that Heath is using are the same contractors he uses on every project. That is a statement of the trust Heath has in his contractors and employees. This is one of those projects that once finished, will be talked about for a long time. I am looking forward to seeing this project unfold. If you want to follow along, the best way is to follow on Instagram (@nicholson_builders). Heath Nicholson Builders is based in Shepparton Victoria Australia. 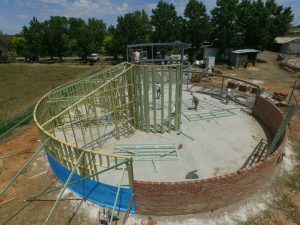 Heath Nicholson Builders aerial photo of framing and brick walls. 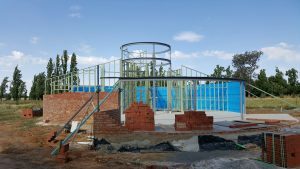 Heath Nicholson Builders house frame stage and bricklaying.